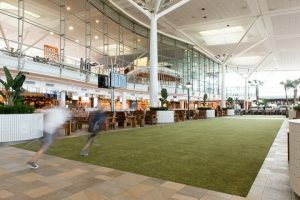 Brisbane Airport Corporation (BAC) is set to bring the game of cricket to the heart of Brisbane Airport’s (BNE) International Terminal, with former international superstars Brett Lee and Michael Kasprowicz making guest appearances to stage a world first cricket match inside an airport terminal. The match will be streamed live on Brett Lee’s own Facebook page to a global audience. The former Australian cricket players will captain two teams consisting of senior representatives from the India and Australia travel industries, in a twenty-over indoor exhibition style cricket match as part of Tourism Events Queensland’s “Queensland on Stage India” event for 2018. Coinciding with the start of the Indian Cricket Team’s tour of Australia, the match will be held on November 22 in the middle of BNE’s busy International Terminal for the enjoyment of departing passengers and the Indian media. Gert-Jan de Graaff BAC Chief Executive Officer said it is an exciting world-first event that not only highlights the great mateship and friendly rivalry between Australia and India, it provides a unique opportunity to strengthen and celebrate tourism between the two nations. “India and Australia share a love of family, travel and cricket, so we thought we’d take the opportunity to celebrate these shared values with a bit of fun, whilst also showcasing Brisbane as an aspirational travel destination offering a wide range of experiences for Indian visitors. “India is one of the world’s fastest growing outbound travel markets with more than 300,000 Indians visiting Australia last year and more than 33,000 of those visiting Brisbane, which was a 36 per cent increase on the previous year. “India is also Australia’s third largest trading partner, with total merchandise exports trade more than $9 billion. This means Queensland has around 60 per cent share of Australia’s total trade with India, including 13 per cent share of Indian students in Australia. “Being able to showcase Brisbane Airport as the gateway to Queensland and Australia will allow existing and new airline partners to reinforce the importance of this growing market. With rising travel demand, and our business and trade relationship showing further growth, BAC is very interested in strengthening connections with the India market,” Mr de Graaff said. “India has always been a special place for me. I love the colour, the culture and most of all, the people. Indian travellers love Australia, and there’s a huge opportunity to showcase all the new tourism developments happening in Brisbane to the India market, because the city is transforming so quickly. I think Indians should see it for themselves that there’s just so much happening here,” Mr Lee said. Australia – India Council Board Member and Non-Executive Board Director of Cricket Australia, Michael Kasprowicz, said he is looking forward to competing against Brett and showcasing the city of Brisbane to the India market. “Having spent plenty of time in India, I know how much Indian travellers want to come to Australia for a holiday. Brisbane is a city that is quickly developing into a major tourism destination, and I’m excited to be a part of the effort to showcase all these new developments to the India market,” Mr Kasprowicz said.